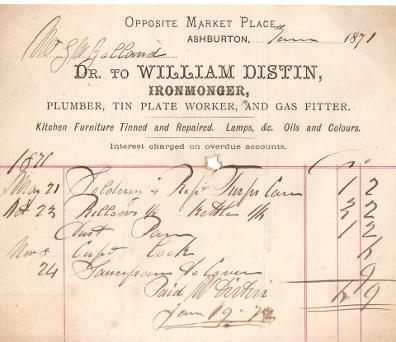 Right: This is a receipt for an 1871 bill from William Distin, ironmonger, plumber, tin plate worker and gas fitter. He also advertises that kitchen furniture can be tinned and repaired, and that he deals in lamps etc., oils and colours. The bill, to Mr G W Yolland, is for various items, including bellows, a dust pan and a cupboard lock. 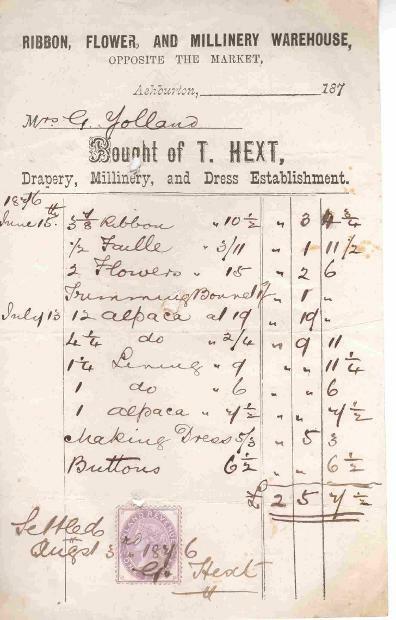 Left: A receipt issued by T Hext, 'Opposite the market', a business described as a ribbon, flower and millinery warehouse, and a drapery, millinery and dress establishment. Mrs G Yolland has bought various items, many, if not all of them apparently used in a dress that was made for her in 1876. The 1881 census shows a Thomas Hext, draper, in North Street. Aged 57, he is living with his wife Elizabeth J and his daughters Amy and Bessie. It is possible that it was made in 1865 to commemorate the 200th anniversary of the church. In 1915 the Western Times reported that the Congregationists in Ashburton were celebrating the 250th anniversary of the founding of their chapel, and the centenary of the Sunday School. 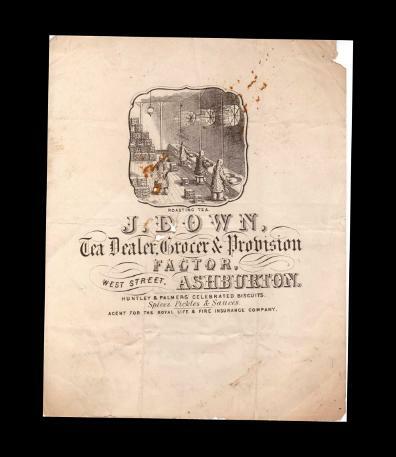 Opposite is a document, with a receipt on the back, from J Down, Tea Dealer, Grocer and Provision Factor, West Street, Ashburton. The picture 'Roasting tea' shows Chinese workers in traditional costume, complete with pigtails. The 1891 census shows a John Down, Grocer and provision dealer, two doors up from the Rose and Crown (a public house on the corner of West and North St). 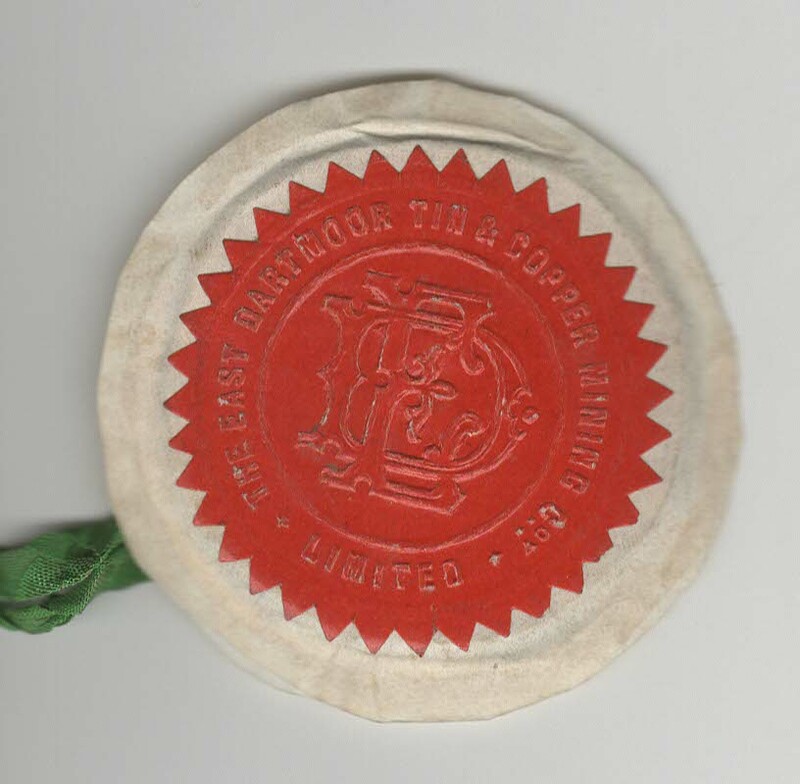 The receipt on the reverse shows that Mr Yolland paid two pounds seven and eight pence to the firm of E S and A Robinson & Co., Bristol, in 1873 (month unclear) - E S and A Robinson was a paper, printing and packaging company founded in 1844. Right and below: Policy No. 588428 from the Phoenix Assurance Company. 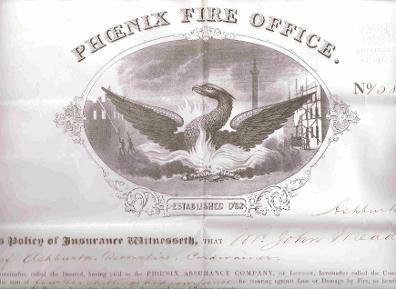 Mr John Mead, cordwainer, took out fire insurance for three properties in Heavyhead Lane, totalling £170, at an annual premium of 14s 4d. front, said Mr Maddock carries on his trade as a cabinet maker, situate in Heavyhead Lane Ashburton aforesaid. £25 on a private dwelling house adjoining stone and slated in tenure of E Mortimer. (total) £170. NB The above are away from any thatch except one cottage so roofed adjoining the building named in the 1st item. * In 1881 77 year old John Maddick, cabinet maker, is shown as living in Heavyhead Lane. His relationship to the head of the house, Maria Pengilly, is uncertain. She is a widow - also living in the house are Lewis Pengilly, Richard and James Gilly, all described as 'son law', and Eliza Syms, described as a niece. 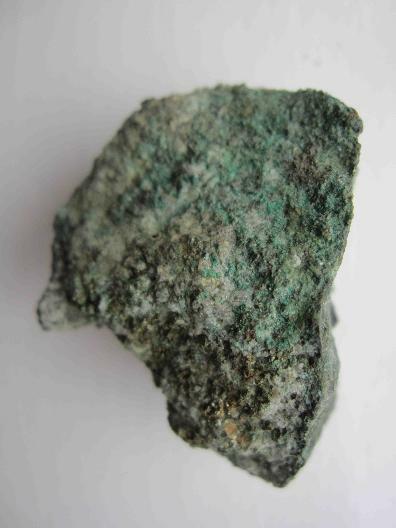 Right: A piece of copper ore (at least I think it is) collected from Druid Mine in the 1950s. The mine was working in the latter half of the 19th century. 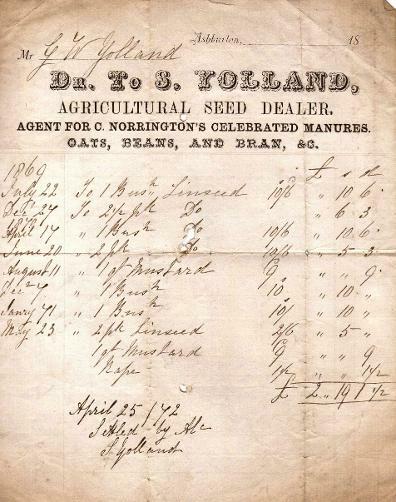 Left: This is a receipt from S. Yolland, for supplying seed (mostly linseed and mustard) to G W Yolland. The 1861 census shows Stephen Yolland as a corn and seed dealer in East Street - the receipt here also advertises that he is an agent for 'Norrington's celebrated manures'. 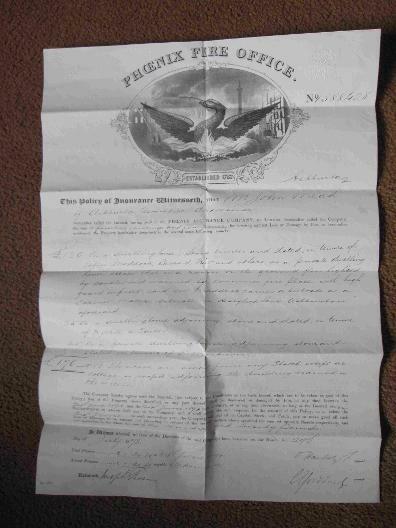 Although the receipt is dated 1872, Stephen had in fact died by this date - 23 MAY 1867 according to the Yolland Family tree on World Connect. 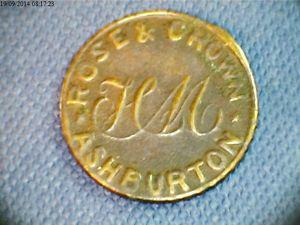 Right: A pub token from the Rose and Crown, Ashburton, probably made of brass. The initials HM suggest that this was produced during the time that Henry Mugford was landlord, sometime around 1871 (see the Inns and hotels section of Banks and businesses). 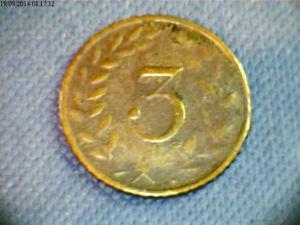 It is uncertain exactly how these tokens were used: Bob Lyall, on www.numsoc.net/pubtokens.html says that the value, in this case 3d (three old pence) was usually the cost of a half pint or pint of beer, and may have been redeemed in connection with using the sporting facilities of a pub, or possibly when a room was hired. Image courtesy of the owner, to whom many thanks.